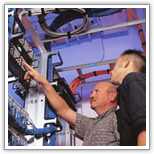 The RCA's professional services portfolio is a complete one, covering a range starting with site engineering and installation and ending with network and equipment maintenance. The skills and expertise available in the company are well distributed among each and every service, giving the opportunity to our customers to receive constantly the requested quality of service within agreed time limits. How can RCA Group product and services help you? The following case studies we will show you the way that we have implemented several projects which helped our partners and customers to have an increased productivity, better integration and reliability and cutting costs at the same time. RCA Grup offers a wide area of services, from site engineering and radio relee or GSM/UMTS installation to equipments and network maintenance. In order to offer to our customer a premium quality and efficiency, we develop internally a knowledge library for each services. Copyright © 2009 RCA GRUP. All rights reserved.